Mark Iverson of Bowling Green, KY, MU and Ray Hardin of Decatur, AL, Utilities teamed with TVA’s Dan Pratt and Max Schmitz of Altec to win the Power Play Golf Tournament, played Oct. 1 in Bowling Green. 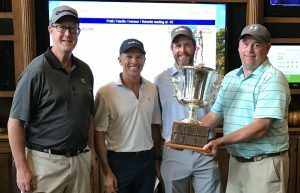 With their 10-under-par 62 at The Club at Olde Stone, Iverson, Hardin, Pratt and Schmitz will get their names engraved on the tournament trophy, the Johnny Hayes Cup. All told, more than 110 players turned out for the annual Power Play Scholarship Association fund-raiser. The Association expects to award 30 college scholarships, worth $4,000 each, next spring to TVPPA-member utility staff dependents who’ve excelled in their classrooms and communities. Since its 1995 inception, the Association has presented 578 scholarships, totaling more than $2.2 million. Meigs tipped his hat to tournament co-sponsors Central Service Association and Service Electric, breakfast sponsors TVPPA and Seven States Power Corp. and lunch co-sponsors TECA and Honeywell Smart Energy. “Each year, we look forward to this special opportunity to work together in support of a worthwhile program that provides another opportunity to demonstrate the unique value of public power,” Meigs said.